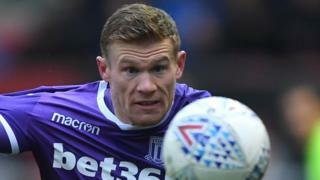 Republic of Ireland footballer James McClean is to receive damages from a Belfast councillor who falsely referred to him as a "super Provo". Ulster Unionist Party representative Chris McGimpsey, who made the comments, has issued an unreserved apology. He said the unfounded comment were made "in the heat of the moment" on a radio programme. In a statement, Mr McClean's lawyers welcomed the apology and said they were confident the damages would "reflect the seriousness and gravity of the offending comments". "Whilst this case was both unnecessary and avoidable, it allows our client to demonstrate that he will protect and uphold his reputation and good name at every opportunity and with all the determination that he displays as a professional footballer," the statement concluded. Mr McClean, 29, issued defamation proceedings following the UUP councillor's appearance on BBC Radio Ulster's Nolan Show in November last year. The Derry-born footballer's lawyers told the court the remarks were then repeated and became the focus of commentary on social media. As part of steps to resolve the legal action, a barrister for Mr McGimpsey read out a statement in open court. "On November 9, 2018 Christopher McGimpsey made a statement in the course of a debate on the Stephen Nolan Show in which he referred to James McClean as being a 'super Provo'," David Dunlop said. "Mr McGimpsey did not intend to communicate that there was any affiliation between Mr McClean and the Provisional Irish Republican Army." The barrister went on: "Mr McGimpsey made this statement in the heat of the moment and did so without taking adequate care to consider the implications of those words. "Mr McGimpsey had no basis whatsoever for suggesting any connection between Mr McClean and the Provisional Irish Republican Army." Mr McGimpsey has agreed to pay damages and legal costs to Mr McClean. Mr Dunlop told Mr Justice Maguire the level of damages his client should pay Mr McClean remains to be established.